Today's Lotto: Oklahoma! Enter Now! West End star Tam Mutu returns to the New York stage starring as Al Spanish in Encores! production of Cole Porter’s 1930s Prohibition musical The New Yorkers. Mutu made his Broadway in the title role of Doctor Zhivago, and his acclaimed West End credits include Les Miserables, Love Never Dies, Chess, Romeo and Juliet, and City of Angels. This fall, he will lead the Broadway-aimed revival of The Secret Garden. BroadwayBox caught up with Tam to talk about why Encores! has him crying into his pillow, bringing City of Angels back to NYC, and what a buddy sitcom with pal Ramin Karimloo would look like. 1. This is your first Encores! show. What’s surprised you most about the experience? What excites you most about it? It is my first! I feel so lucky to be part of it and working with this amazing cast and creative team. It's a huge event in the NYC theatre calendar and has such a history to it. To be part of that is very exciting and special. To me this is what theatre is all about—people coming together to have fun and create. It's fast and frantic; you barely have time to get to know everyone before you are onstage, but there is a great sense of comradery. John Rando has been so amazing at creating that environment. We honestly are having a blast. I mean to put on a complete show in under 2 weeks?! Crazy! But it's a great lesson in trust and also diving into the unknown. You have to embrace it and try (he says crying into his pillow at night) to enjoy it and trust that someone will be there to catch you. I think the audiences are in for a surprise treat. I will say no more! 2. What is something you learned about yourself through Doctor Zhivago on Broadway? It was my Broadway debut so it was so special, but I also had the unfortunate experience of it not lasting very long. I learned that whatever we do we must enjoy it. Try to be present and grateful and enjoy the moment. We have the opportunity to be storytellers to audiences from all over the world, and every experience will be different. There will be highs and lows. Not everything is going to last or be critically acclaimed, but every experience somewhere at sometime will have touched or moved someone. We sometimes forget that. So enjoy the ride. 3. Which of your London credits do you most wish New York audiences could see? I loved my time at The Donmar Warehouse performing in City of Angels. It's such a great show and I was so lucky to have a wonderful cast and creative team. David Zippel was heavily involved, which was a treat (he is such a lovely man), and Josie Rourke (the director) created a special experience for all of us and one I will always be grateful for. I think NYC audiences would have enjoyed the show. It's due for a comeback, isn't it? I would love to do it again and to do it here in NYC...well that would be VERY special. 4. What excites you most about starring in The Secret Garden this Spring? I get to go to Seattle (a new city for me) and work on this wonderful show and sing that amazing score. It's a joy to be reunited with Lucy Simon. She really does write a tune, doesn't she? I also get to follow in some very talented footsteps and that's always very special. I hope I do it justice. 5. If you and Ramin had your own buddy sitcom or reality show, what would it be called? Ha ha ha! Oh boy wouldn't that be fun?! Could you imagine? I can see all the shaking heads now! Ha ha ha! The TamRam show? RamTam? Sultans on Broadway? Am open to suggestions. Need to get Telsey and Binder on this right away. Ramin is going to die. Ha! 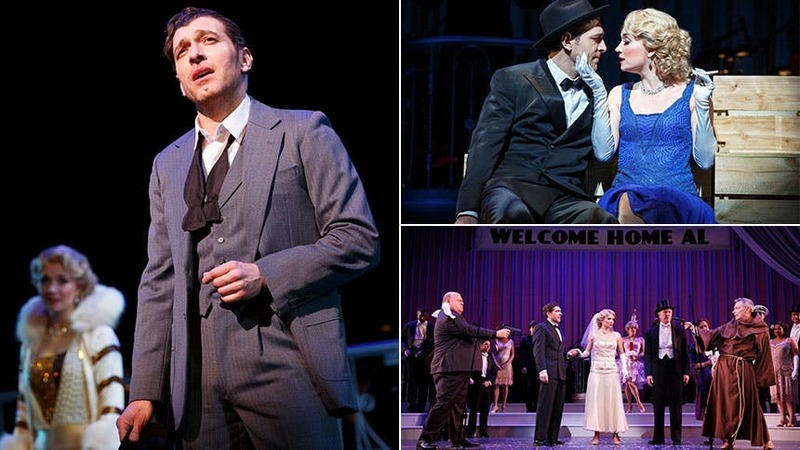 Hurry to New York City Center to see Tam Mutu star in 'The New Yorkers' from March 22-March 26.